The prophet Isaiah lived around 735-681 BC. He foresaw the sacking of Jerusalem by the Babylonians and the Jews taken into captivity into Babylon. The Persians defeated the Babylonians. As predicted by Isaiah, Cyrus, a Persian king, allowed the Jewish exiles throughout the Persian Empire to return to Jerusalem and rebuild God temple there. Judah became Judea, a province of the Persian Empire which was the height of its power 550-330 BC. The Persia Empire acted as a shield for small Judea, even allowing Judea to have its own governor. Persia protected Judea from other countries, i.e., Egypt. Persians (present day Iran) continued to protect the Jews. For example, Esther became Queen in Persia and shielded the Jews in the Persian Empire from being massacred. Astrologers followed a star from Persia to Jerusalem to find and worship Jesus. They shielded Jesus by withholding information from King Herod about the specific location of Joseph, Mary, and Jesus’s home. Thus, Joseph had time to escape King Herod by taking his family to Egypt. This plant was developed in Myanmar, a country in Southeast Asia south of China and east of India. Myanmar has a tropical climate. The plant is most success in USDA plant zone 10 but can (sometimes) grow in zones 8 -11 outdoors. Most gardeners grow this beautiful plant indoors to regulate its environment and keep it flourishing. When growing the plant indoors, the plant must be in heat of over 60 degrees. Space Persian shield plants about 36 – 48 inches apart. On the back deck (Plant Zone 7), my plant grew as tall as three feet in one season. One of the appeals of a Persian shield plant is its natural bushiness. However, you can make it even more bushy in appearance by pinching the stems back every now and then. Persian shield plants require constant moisture. Water them thoroughly and evenly twice a week. The top six inches of soil should be constantly moist. Because the Persian shield plant was only recently developed, it is not a Bible plant. However, the symbolism of Persia acting as a shield for Judea and even Jesus is seen in the Bible. Persia is present-day Iran. The name Persian shield most likely came from the motif on the shield of Persia soldiers during Persia’s years of conquest and rule. A shield is a protective device. It prevents arrows, javelins, and other projectile devices from killing or wounding a soldier. St. Paul wrote that with the shield of faith, Christians can withstand the fiery darts of Satan (Ephesians 6.16). Reflection: How’s your shielding? Wouldn’t it be great if Persia (Iran) acted as Israel’s shield in the 21st century? The story of Ezekiel making bread from legumes and grains is told in Ezekiel chapter 4. Ezekiel was a prophet and priest. About five years after he was deported from Jerusalem, God called Ezekiel to proclaim a message of judgment against the Jewish nation. Much of the judgment focused on Jerusalem as the political, religious, and social hub of the nation. Ezekiel acted out the siege of Jerusalem in a series of symbolic acts. In the first, Ezekiel drew besieged Jerusalem on a clay tablet. In the second symbolic act, Ezekiel laid bound on his sides for 430 days representing the years of Israel’s and Judah’s sin. Ezekiel’s third symbolic act about God’s judgment on Jerusalem represented famine. God told Ezekiel to bake a single cake of bread to eat every day. The bread was to be made from wheat, barley, beans, lentils, millet, and spelt. Taken together the grains and legumes were to weigh 20 shekels, equivalent to about 8 ounces. With the bread Ezekiel should drink about 22 ounces (1.4 pints) of water. While some of these legumes and grains were mixed together to make bread, it was unusual to make bread from all six of them. Several Old Testament scholars reported that the poorest people of the land combined the grains and beans with camel’s milk and oil to make bread; but poverty was not the issue in besieged Jerusalem (Ezekiel 7:18-21). The problem was that basic foods were so scarce in Jerusalem that people did not have enough of one type of grain, e.g. barley, to make bread. People scoured for any grain or legumes available to make a loaf of bread. God ended his instructions to Ezekiel on how to prepare the bread by explaining the symbolic meaning of Ezekiel’s activity. God would break the supply of bread and water to Jerusalem. He would do this so that the Jewish people in Jerusalem would “waste away because of their sin” (Ezekiel 4:17, NIV-SB, 2002). The famine stricken Jerusalemites would be appalled at the sight of each other. Most likely the Biblical millet was Panicum miliaceum. Supposedly a head of millet produces about 1000 seeds, thus the name miliaceum. Other names include the common millet and in the United States, the broom corn millet. Millet was one of the earliest cereal grains domesticated. In Mesopotamia, millet dated back to 3000 B.C. No early traces of millet were found in Israel; millet was listed in only one of three Israeli plant databases studied. Millet is the 6th most important gain in the world and helps feed 1/3 of the world’s population. The fruit is the millet seed. Each ripe cluster contains a multitude of seeds enclosed in a round, hard hull. Hulls are various colors from white through black and are removed via threshing. The bran or seed coat is always creamy white. Millet is a gluten-free seed that has been described as tasting mildly sweet with a nut-like flavor. Besides being cultivated for human food, millet is also used for bird and poultry seed. 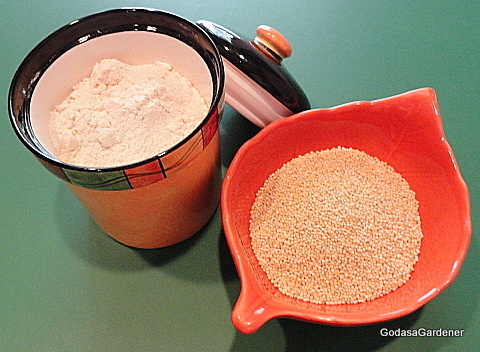 Millet occurs once in the Bible, as one grain that Ezekiel used to make bread (Ezekiel 4:9). P. miliaceum, the smallest of all cereal grains, symbolizes famine which kills millions of people. Almost every time famine was seen in the Promised Land, it was God’s punishment for Israel’s sins. Often famine resulted from God withholding rains; but sometimes there were other causes of famine. For example, during the time of the prophet Joel, God used locust to create famine in Judah.The famine that God showed to Ezekiel occurred when the Babylonian army encircled Jerusalem, destroyed the produce of the land, and ensured that no one could get in or out of the city. Although the Babylonians besieged Jerusalem, the famine was God’s punishment on the Jews because they rejected him and worshipped idols. God told Ezekiel that 1/3 third of Jerusalem’s population would die of pestilence or famine, 1/3 would be killed by the sword, and 1/3 would be scattered to the winds with the sword pursuing them (Ezekiel 5:12). God foretold cannibalism in Jerusalem saying that fathers would eat their sons and sons eat their fathers (Ezekiel, 5:10). Most of us don’t have experience with famine to the point of cannibalism. In fact, most of us have never been seriously hungry. Looking ahead, however, this scenario may be different. Christ warned his disciple that near the end of the ages, famines and earthquakes would occur in various places (Matthew 24:7, Mark 13:8). Even though we live in the United States with an abundance of food, we should not assume that our country will be exempt from the famine that Christ foretold. At the end of the ages, famine will not be restricted to sub-Saharan Africa or parts of southwest Asia. In Revelations chapter 7, John recorded that the Lamb opened seven seals. Many scholars interpret the opening of seals as prophecy of what will occur on earth during the Great Tribulation. Opening the fourth seal set free a pale horse (Revelations 6:7-8) with a rider named Death. Hades followed Death. Death and Hades were given authority over ¼ of the earth. They were allowed to kill with the sword, famine, pestilence (epidemic disease), and wild beasts. These disasters echo the punishment that God inflicted on Judah, whom he selected from all the races, nations, and tribes of the earth as his Chosen People. Reflection. God punished Jerusalem and the Jews with famine. What does the future hold for you, our nation, and our world? Photo is of a mature cotton flower before turns in boll. Esther is the last of the historical books of the Old Testament. It is the story of a beautiful Jewish girl who became wife to Ahasuerus (Xerxes), king of Persia (486-465 B.C.). The story begins with Ahasuerus giving an elaborate banquet for his nobles and officials. The banquet was held in the palace’s enclosed garden. The garden had white cotton curtains and violet hangings fastened with cords of fine linen and purple to silver rings on marble pillars (ESV). Queen Vashti gave a banquet for the women in another part of the palace. Feeling merry, Ahasuerus commanded that Vashti come before him to display her beauty to his guest. Vashti refused. Because of her disobedience, Ahasuerus divorced Vashti. Subsequently, Esther became queen. Then, the plot of the book unfolds. Haman, an enemy of the Jews and chief advisor to Ahasuerus, determined to murder all the Jews throughout Persia. Ahasuerus consented to Haman’s plans not knowing that Queen Esther was a Jew. Esther’s uncle Mordecai sent word to Esther that she must plead to Ahasuerus for the lives of the Jews. Although frightened, Esther agreed to make the plea on behalf of her people. Esther planned two private banquets for Ahasuerus and Haman. At the second banquet Esther humbly admitted she was a Jewess. She disclosed Haman’s scheme to destroy her people. Both Ahasuerus and Haman were stunned. They were unaware that in ordering the murder of all Jews, they ordered the Queen’s death. Angrily Ahasuerus ordered Haman to be hung. Because Ahasuerus could not undo his previous decree, he sent out another decree enabling the Jews to destroy any armed force that might attack them and to plunder the property of their enemies. Purim is celebrated on the 14 day of Adar which is usually in March. In March 2012 at the time of the Festival of Purim, the Prime Minister of Israel visited the United States President and presented him with a scroll of the book of Esther. Young cotton flower, before turning cream-colored. The white cotton curtains (Hebrew karpas) of Esther were probably Gossypium herbaceum also known as Levant cotton and Arabian cotton. G. herbaceum was domesticated in India about 3000 B.C. and present in Mesopotamia about 1000 B.C. Ahasuerus ruled lands from India to Ethiopia; consequently, finding cotton curtains in his palace is reasonable. In the 7th century B.C. cotton was present in Horvat ʽUza located in the Arad Valley in Palestine. Certainly, the exiles would have brought cotton fabric, if not plants, back with them from exile in Persia. G. herbaceum is not the same species of cotton grown in present-day Israel, nor is it grown in the United States. When cotton plants are irrigated, most flower mid to late summer. Large, showy, solitary blooms have five petals (1-2 inches long). Flowers are yellow (occasionally white) at first, then fade to a soft red or pink. The cotton plant fruit is called a boll. When ripe, the boll splits and a mass of fine white filaments or fibers exude. The white fibers are the cotton of commerce. Seeds are contained in the white fibers. In ancient times seeds were separated from fibers by hand. With the invention of the cotton gin in the 18th century, seeds and fibers are separated mechanically. In Ahasuerus’ palace, curtains were made from cotton. Curtain has several meanings to include 1) a hanging screen that can be drawn back, 2) a device that conceals or acts as a barrier, or 3) the time that a theatrical performance begins. In the first chapter of Esther, the cotton curtains were associated with all three meanings. Technically, the white cotton curtains were tied back by cords of fine linen and purple to silver rods. In inclement weather or to obscure the sun’s rays, the cotton curtains could be let down. Figuratively, the curtains symbolized Esther concealing her nationality. They symbolized Haman’s concealed desire to murder Mordecai; yet convincing Ahasuerus that all Jews should die because they disobeyed the king’s laws. Finally, the cotton-curtained plaza was the stage where the first act of the drama of Esther began. Earlier in this blog, we studied the importance of the veil or curtain in the Tent of Meeting. That curtain was made of linen not cotton but it also concealed, e.g., the Most Holy of Holies room from the Holy of Holies room. The chief priest entered the Most Holy of Holies one time per year and then only after making blood sacrifice for his own sins and the inadvertent sins of the Israelites. Christ death changed the curtain separating the two rooms of the Temple. When Christ died, the curtain separating the Most Holy of Holies from the Holies of Holy rooms tore from top to bottom. Similarly, Christ’s death tore the curtain separating us from God. God became open and available to us; no longer concealed by a curtain. Now through the blood of Jesus Christ we have confidence to stand before God (Hebrews 10:19). Reflection: We have ready access to God through Christ. No more curtain between us and Abba, our Father. Now the only one who can keep God concealed from us is us. “The men of Rhodes traded with you, and many coastlands were your customers; they paid you with ivory tusks and ebony” (Ezekiel 27:15, NIV). Ezekiel chapter 26 is named “The Prophecy Against Tyre” and Chapter 27 “The Lament over Tyre” (Ezekiel chapters 26 and 27, NIV). The most outstanding sailors in the ancient world, the Phoenicians built Tyre. It was an important commercial center located on the eastern side of the Mediterranean Sea. Tyre encompassed both a mainland city and an island city one-half mile offshore. Both parts were well fortified. Probably, you remember the name Tyre because King Ahab of the Northern Kingdom of Israel married a daughter of the king of Tyre. The princess was named Jezebel, she was a Baal worshipper. After conquering Jerusalem, Nebuchadnezzar laid siege to Tyre. The siege lasted 13 years. Although the Babylonians captured the mainland city, they were unable to capture the island city. Alexander the Great used lumber and construction materials from the main city of Tyre to build a causeway to the island fortress about 332 BC. The Ebony tree is the Diospyros ebenum (or D. ebenaster). The ebony tree is a hard, heavy, durable, close-grained wood that when polished will show a glistening shine. Ancient Greeks and Roman’s loved ebony because it could be made into beautiful furniture. Ceylon ebony wood was in such high demand that this tree species was threatened with extinction. In 1994 the World Conservation Union included Ceylon (Sri Lanka) ebony tree in the Red Book so that trees could not be readily harvested. Laws in both Sri Lanka and India prohibited international trade of the wood. The tree produces a persimmon-like fruit. As you may suspect, we don’t have a Diospyros evenum in our church Bible garden. We do have a Diospyros virginiana. It is a persimmon species commonly called the American persimmon. In the United States, the tree grows wild. Native Americans cultivated it for its fruit and wood since prehistoric times. The American persimmon tree grows 66 feet tall in well-drained soil. In summer, this species produces fragrant flowers. To obtain fruit you need a tree that produces female flowers and tree that produces male flowers. We have only one tree at this time, but I am considering getting another. Most cultivars set fruit without pollination. Insects and wind are primary pollinators. Typically fruiting begins when the tree is about 6 years old. The fruit is round or oval and usually orange-yellow, sometimes bluish, and from 0.79 to 2.4 inches in diameter. In the U.S. South and Midwest, fruits are referred to as persimmons. Often you will see persimmon jelly in fine stores. The great general Nebuchadnezzar was able to conquer Jerusalem, but not the island city of Tyre even after 13 years of trying. This bit of history caused me to suspect that if God had not abandoned Jerusalem it wouldn’t have been captured. Tyre fell as Ezekiel prophesied or, more accurately, as God ordained. This world is destined for destruction; then God will create a new heaven and a new earth (Revelation 21:2). Just as Ezekiel’s prophecy became reality, so will John’s revelation. Reflection: No individual, city, or country can stand against God. I am okay with that fact. Are you? Nehemiah chapter 8 tells the story of the Jews cutting wild olive boughs to make booths for the Festival of Tabernacles (Sukkoth). After Aharuerus’ death, Artaxerxes I (465-425 B.C.) ruled the Persian Empire. His support for the Jews may have been related to a positive relationship with the Jew Mordecai, the chief official during Aharuerus reign. In his 7th year as king, Artaxerxes aided the priest-scribe Ezra to return to Jerusalem (458 B.C.). Ezra’s main contribution to restored Zion was interpreting and exhorting the Jews to keep the Mosaic laws. Nehemiah was cup-bearer and personal confident of King Artaxerxes I. When Nehemiah heard (circa 445 B.C.) that Jerusalem’s walls were not yet rebuilt, he grieved. The first Jews had returned to Jerusalem over 90 years earlier. Nehemiah secured support from Artaxerxes I to go to Jerusalem and rebuild the city walls. Working almost day and night, the Jews rebuilt Jerusalem’s walls in 52 days (Nehemiah 6:15.). Excavations showed the Jerusalem city wall built in Nehemiah’s time was about 9 feet thick. After the city walls were rebuilt, the Jews assembled in Jerusalem. At this time Nehemiah was governor and Ezra was chief priest. Ezra read from the Book of Law. Hearing God’s laws and statutes, the listeners became aware of their transgressions and began to weep. Nehemiah told them to stop weeping and to celebrate the restoration of Jerusalem by feasting. The following day, family heads met with Ezra to discuss the Law they heard read. Part of the Law required that the people live in booths during the feast of the 7th month, the feast of Tabernacles or booths. Ezra directed the people to go into the hill country and bring back branches to build the booths. The types of branches were from olive and wild olive trees and from myrtle, palm, and shade trees. In the past various Bible scholars translated the Hebrew êtz shamen as oil tree or pine tree; however, today most Bible scholars and botanists agree that êtz shamen is the wild olive tree. The wild olive tree is the Elaeagnus angustifolia, also known as the oleaster and Russian olive. The oleaster was native to southern Europe and western Asia. Dense stands are present in river bottoms where the water table is seldom more than two feet below the ground surface. At the same time, oleaster is drought tolerant and indifferent to wind and heat. In Israel, oleaster is found in woodlands (e.g., around Mount Tabor), shrub-lands, and on Mount Hermon. In some parts of the United States, oleaster has naturalized and is considered an invasive weed. Oleaster is a thorny shrub or small tree. The oleaster tree has several uses. It can be used to make booths for Jewish festivals. The flower produces oil used to make perfume. A gum from the plant is used in calico printing. The hard, fine-grained wood of the trunk and branches is used for posts and beams and for wood carving. The wood makes excellent fuel. In some countries, to include Palestine, oleaster trees are pruned into hedges. Despite building a secure wall around Jerusalem in a short 52 days, the Jews were aware that their security did not come from rocks and mortar. Their security came from God. As early as the days of King Solomon, the Jews had a proverb that described the source of their security: “He who fears the Lord has a secure fortress, and for his children it will be a refuge” (Proverbs 14:26, NIV-SB, 2002). Just as Old Testament Jews relied on God for their security, so do New Testament Christians. Christians have a secure position based on Christ as savior and redeemer. Still, St. Peter cautioned new Christians to be on guard so that they did not get carried away by lawless men (and women) and fall from their secure position (2 Peter 3:17-18). In addition to guarding against erroneous teaching, Christians are to grow in the knowledge of Christ. Over the past year, I spent time writing this blog, e.g., reading the Bible story where the plant is located along with its historical setting, researching the plant origins and characteristics, and prayerfully considering the plant’s symbolism. Recently, I’ve become convicted about the time consumed by these activities – albeit Bible-centered activities. They have taken from and taken over my God-focused time and my prayer time. I think Peter would have included my deviation from God-focused devotions as a way to fall from a secure position in Christ. Reflection: Think over your activities, e.g., church related and possibly even Bible-study related. Are any of them interfering with God-focused time? The story of the return of the first exiles is told in 2 Chronicles 36:22-23 and Ezra chapter 1-3:6. King Cyrus of Persia conquered Babylon in 539 B.C. One of his first acts was to decree that the Jewish people could go to Jerusalem and re-build the temple to their God. Cyrus returned to Sheshbazzar, a prince of Judah, articles from the first temple that Nebuchadnezzar brought from Jerusalem. In 537 B.C. a company of close to 50,000 individuals along with horses, mules, camels and donkeys arrived in Jerusalem. Several months later, the Jews assembled in Jerusalem. The priests Zerubabbel and Jeshua built the Altar of the God of Israel. Despite the Jew’s fear of surrounding peoples, they sacrificed burnt offerings on the Altar according to the Law of Moses. Both morning and evening sacrifices were made. Then, following the Law of Moses they celebrated the Feast of Tabernacles (Leviticus 23:33-43). The Feast of Tabernacles also called the Festival of Sukkoth (booths) was a festival of joy, referred to in Jewish prayer and literature as the Season of Rejoicing (Rich, 2011). The significance of Sukkoth is two-fold: a) reminder of the 40 years the Children of Israel wandered in the wilderness living in temporary shelters and 2) a celebration of the fall harvest. Sukkoth lasted seven days. During the seven days, or some part of the seven days, Jews built and lived in temporary shelters as their ancestors did in the wilderness. 4) three myrtle branches, in Hebrew called hadassim. The palm, two willow, and three myrtle branches were bound together and collectively known as the lulav because the palm branch was the largest plant. The lulav was placed in the right hand and the etrog in the left. Jews recited a blessing and waved the species in six directions (east, south, west, north, up, and down), symbolizing that God is everywhere. In ancient Jerusalem the four species were held while Jews processed around the Altar of the Temple. The citron of Sukkoth is the Citrus medica, also known as goodly fruit. The origin of the citron is not known; possibly it came from India. Seeds were found in Mesopotamia excavations dating back to 4000 B.C. The original goodly fruit of Leviticus may have been a cone from the cedar tree; however, by the Restoration, the citron was the accepted goodly fruit. Citron is acclimated to a wide variety of soils as long as soil is aerated. Citron is a small evergreen shrub or tree growing to a height of 15 feet. The economic life of the tree is 25-30 years. Larger fruit grow from branch cuttings than from seeds, therefore most propagation is done through cuttings. The fruit is about the size and shape of a lemon. The outer rind or peel can be smooth or rough with many ridges and indentations. When young, the fruit is dark green, but turns yellow with maturity (in about 3 months). When fruit ripens on trees, citrons are aromatic and the inner peel is very tender. In comparison to other citrus fruits, citron pulp is drier, sourer, and less tasty. The main use of citron is in religious celebrations, e.g., The Festival of Tabernacles. Also, fruit peel is candied and used as a flavoring in cakes, pastries, and jams. Citron peel is used to produce citron water and may be used to flavor wine and vermouth. In the past, citron had been associated with perfection and hope for fertility and abundance in the new agriculture year. When the returned exiles celebrated Sukkoth with the citron, they were hopeful. Once again, they were in the Promised Land; they hoped for a new future in Jerusalem. The archaic or ancient definition of hope is desire accompanied by expectation that the desire would be fulfilled. Another word for hope is trust. Prophets predicted the exile of the Jews because of their apostasy. These same prophets promised that God, not an earthly king, would restore the Jews to their home land. After 70 years of captivity, they were home and remembered God’s promises (Jeremiah 29:10-14). God said he would give them hope and a future. He was going to send rain; streams would run again on the dry land (Isaiah 44:3). God knew that newly returned exiles feared their neighbors, so he reassured them that all who raged against them would be put to shame and disgraced (Isaiah 41:11). The Festival of Tabernacles was a wonderful time to come together as a community, praise God for his care, celebrate the abundance of the fall harvest, and hope – expectantly believe – in a prosperous future. The returned Jews planned to rebuild the Temple. Having a new Temple would mean God dwelt in their midst. In contrast, New Testament Christians know that Christ lives in them; he is always in their midst. At the same time, they live in hope. Their hope is for eternal life, the redemption of their bodies when Christ comes the second time (Romans 8:23-25, Titus 1:2). Paul wrote to the young churches about hope. He told the Romans that hope that is seen is not hope at all because no one hopes for what they already have (Romans 8:24-25). Rather we hope for what we do not have and have not seen. While we are hoping for eternal life with Christ, our attitude should be joyful (Romans 12:12). Many times people who are hopeful and yearn for something do not feel joy; they are anxious, restless, and cannot sleep at night. Yet, Christians do not have to experience any anxiety about life after death and redemption of our bodies. Our belief and trust — our hope — for eternal life comes from God, who cannot lie (Titus, 1:2). Christians live in hope, but still experience trials, temptations, and persecution. Paul wrote to the Thessalonians, that he constantly prayed for their endurance inspired by hope in Jesus Christ (1 Thessalonians 1:3). St. Peter advised us to not be surprised by the painful trials we suffer as if something strange was happening to us (1 Peter 4:12). Rather hope in eternity with Christ helps us endure the present on earth, where we live as strangers. Reflection. “May the God of hope fill you with all joy and peace as you trust in him, so that you may overflow with hope by the power of the Holy Spirit” (Romans 15:13). The story of Zechariah’s vision of horses among myrtle trees is in Zechariah 1:1-17. The first year the Jewish exiles returned to Jerusalem they rebuilt the Temple Altar. The second year (536 B.C. ), they laid the Temple foundation. Non-Jewish people who lived in the area, largely Samaritans, offered to help rebuild the Temple. When the Jews refused their assistance, these enemies initiated a systematic program to discourage the Jews from rebuilding the Temple. Temple construction stopped for about 10 years through the end (530 B.C.) of Cyrus reign down into the reign of Darius I (522-486 B.C.). In the 2nd year of Darius reign, God spoke through the prophet Haggai (August, 520 B.C.). God’s message was for the Jews to complete the Temple. Haggai attributed the drought in Judah to the Temple being in ruins. Almost immediately the Jews initiated Temple construction. Two months after Haggai message from God, Zechariah received a message. Zechariah’s prophecy mirrored that of Haggai, e.g., rebuild the Temple; but included that the Jews repent and serve the Lord. Several months later Zechariah received eight visions in one night. In the first vision, Zechariah saw a man riding a red horse. Then, the man stood among myrtle trees in a ravine. Behind the man were other horses. The man explained to Zechariah that these were the riders that God sent throughout the earth. The riders came back and reported that the world was at peace. Hearing the riders’ reports, the angel of the Lord asked God how long he was going to withhold mercy from Jerusalem. God responded with kind and comforting words to the concerned angel: God was jealous for Jerusalem and Zion. He was angry with the nations who punished the Jews because they went too far in brutality against Judah. God’s plan was to punish the offending nations and return to Jerusalem with comfort and mercy. He promised that Judah’s towns would again overflow with prosperity. The setting for Zechariah’s first vision is defined in detail. The man who rode the red horse stood among myrtle trees in a small, narrow, steep-sided valley. MacDonald (1995) said that the myrtle trees in the ravine represented Israel under Gentile subjection. In the Bible, the angel of the Lord is often identified as the second person of the Trinity (Christ); consequently, it was Christ expressing his concern for the well-being of the Jews and Jerusalem (Adeyemo, 2006). The myrtle of the Bible is the Myrtus communis. Its origins are the Middle East and the Mediterranean region. At one time wild myrtle was common throughout Palestine and Lebanon. Today in Israel, most myrtle bushes are grown intentionally and used for ornamental purposes; however, some wild plants remain in the Upper Galilee and Golan areas. Although myrtle is hardy to temperatures as low as 5 degrees Fahrenheit, it is damaged by cold drying wind. Myrtle is classified as an evergreen shrub or small tree that will grow to 24 feet tall. The myrtle fruit is a purplish-black berry known in the Middle East as mursins. Mursins can be dried then ground add flavor to stews or boiled to yield a jelly or a beverage. The myrtle is one of the four blessed plants used in the Jewish Festival of Tabernacles (Sukkoth). To fill the requirement for Sukkoth, three leaves must grow from one point on the myrtle stem. Jewish sages compared the myrtle, which has a good smell but no taste, to Israelites those who do good deeds, but do not study the Torah (first five books of the Old Testament). Many world cultures assigned meaning to the myrtle blossom to include beauty, love, paradise, and immortality. For the Jews, myrtle can symbolize sweetness, justice, divine generosity, peace, God’s promise, and recovery. Zechariah’s vision of horsemen, angels and God among the myrtle trees reinforced God’s promise that the returned exiles would be prosperous. Prosperity means a person or group thrived or flourished and was successful, especially in financial or economic terms. For the Jews of Zechariah’s time to prosper, God required that they repent, serve the Lord, and rebuild the temple Other Bible verses identified additional requirements for prosperity. See Table 4 for a summary of some of these requirements for prosperity. They apply equally to Christians today. When we consider God’s requirements for prosperity, they do not seem particularly onerous, e.g., repent, obey God’s laws, trust God, do what is right in God’s eyes, and be generous. Prosperity not only benefits people who receive God’s abundance; it also benefits and causes joy in the entire city and region (Proverbs 11:10). The Bible revealed reasons that people do not prosper. The chief reasons were the opposite of behaviors that cause prosperity. Disobeying God (Deuteronomy 28:62), having a perverse heart (Proverbs 17:20), and concealing sin (Proverbs 28:13) lead to lack of prosperity The problem is that we all see and know people who have no regard for God or his laws but they seem to get ahead (prosper) in the workplace and in society. How can we meld our personal experiences with what the Bible says, yes, even promises, about prosperity being related to a godly life? The great prophet Jeremiah asked God the same question. Jeremiah’s explicit words were “why do the ways of the wicked prosper” Why do the faithless live at ease?” (Jeremiah 12:1, NIV-SB, 2002). God response was to Jeremiah but also to all of us who ask him the same question. God assure Jeremiah that evil individuals will sow wheat but reap thorns; they will wear themselves out but gain nothing (Jeremiah 12:13). Over breakfast Bruce and I talk about how difficult it is to deal with friends and relatives who do not embrace the ways of Christ. Some are prosperous and seem to live charmed lives. At times their actions are deliberately or indifferently cruel. We know that as Christians, we can not to be offended by what they do, nor can we respond in kind. Instead, our prayers must be that we do not hurt them inadvertently. We need to pray for their redemption and their prosperity. Reflection. Because we are Christians does not mean we will be prosperous. Because a person is not a Christian does not mean he will not be prosperous. Copyright April 4, 2016, Carolyn A. Roth; all rights reserved.